Construction on a new $36m hotel at Wellington Airport is now underway following a ground-breaking ceremony today.Hon. 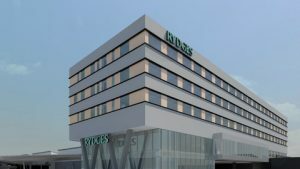 Chris Finlayson officially launched the construction of the four-star 134-bed hotel at the northern end of the airport which will be managed by Rydges and include a restaurant, bar and conference facilities. The hotel, which is expected to welcome its first guests in late 2018, will be fully integrated with the Main Terminal Building, built above the International terminal and accessible directly from inside a newly redeveloped passenger lounge. Steve Sanderson, Wellington Airport’s Chief Executive, said the hotel will be convenient for central New Zealanders and international visitors connecting overseas through Wellington. “The hotel is part of the airport’s wider efforts to improve the experience of everyone who has to catch an early ﬂight or arrive on a late one. Many travellers utilise these international ﬂights and the Airport’s particular focus is on improving its role as the gateway for central New Zealand. TIA Chief Executive, Chris Roberts, says the new hotel will be a welcome addition to New Zealand’s accommodation offering. Wellington Airport’s international market has experienced exceptional growth in recent years welcoming new services from Singapore Airlines, Fiji Airways and Jetstar. International visitor spending in Wellington has reached $716m in the last year and international passenger numbers have more than doubled in the last 15 years to nearly 900,000. Total passenger numbers through Wellington Airport are close to hitting the 6 million mark. terminal and passenger experience. The majority of work on our domestic terminal extension has been completed and work is well underway on the multi-level transport hub. “Although there will be some disruption as a result of the construction work, we believe the hotel and the transport hub will be welcome additions to the airport,” said Sanderson.